HairOmega DHT Blocker Supplement Review | Does It Work? Previously known as Maxahair, Hairomega is one of the hair loss solutions that have taken the beauty stratosphere by storm in the past few years. A simple analysis of their Amazon sales, for instance, is enough to convince you of their unbridled popularity. Is it really the holy grail for those looking to reverse premature baldness and other lifestyle & medical anomalies that often result in hair loss? You can read more about hair loss supplements on our complete review here. 100% Vegetarian suitable, easy to swallow tablets with no artificial dyes. 5000mcg extra strength biotin means you don't have to buy an additional biotin supplement for hair growth. Vitamin C to help support collagen synthesis for radiant skin. Made in the USA in a FDA inspected facility under NSF GMP guidelines for quality assurance. Your safety is our priority. 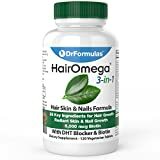 Like any other targeted hair growth supplement, Hairomega employs a unique combination of DHT ( dihydrotestosterone ) to stop and reverse premature hair loss. From a physical and biological point of view, DHT ( dihydrotestosterone ), is a significant hormone particularly as one advances in age. Optimal levels of DHT in the bloodstream is responsible for hair growth, rejuvenation, and maintenance. On the flipside, excess DHT will often result in balding, thinning and flaking of the scalp. To combat this Hairomega is designed to be a dht blocker, by inhibiting the excessive production of DHT it can effectively reducing the action of 5-alpha reductase in the blood. In addition to this, it also contains three active ingredients that are dedicated to boosting blood circulation in the area surrounding the hair follicle cells – these are Gingko Biloba, niacin, and grape seed extract. The combination is then complemented by a nutritional balance of Vitamin A, Vitamin C, Cysteine, and MSM. By supplementing with these essential nutrients you can maintain a health scalp. The action employed by Hairomega which involves reducing the levels of DHT in the blood while at the same time stimulating blood circulation near the scalp area often results in a vibrant hair growth at best or a slower hair loss rate at worst. In addition it can help eliminate free radicals which can damage hair follicles. Working as an anti-inflammatory agent the damage from these free radicals can be significantly reduced. In fact, one of its major DHT-inhibiting ingredients ( palmetto extract ) is proven to have a 60% success rate in stopping and reversing hair loss on its own. And when taken together with other plant sterols – as demonstrated in Hairomega – the formulation has a 75% chance is helping you regain your hairline. Hairomega also contains a significant dose of biotin which helps sustain collagen synthesis. that not only helps promote healthy hair while improving your skin and nails. Using natural plant extracts such as grape seed extract the supplement helps with healthy hair growth. Mineral and vitamin deficiencies are another leading cause of hair loss that is often overlooked. However, Hairomega takes care of this angle by incorporating vitamins B2, B1, B3, and B5 in its one-of-a-kind 3-in-1 combination. In addition, to address possible minerals deficiency in the subjects, Hairomega packs a healthy balance of Zinc and Methylsulfonylmethane (MSM). ??? ?The latter is responsible is for the supply of amino acids which, besides serving as one the main building blocks of hair proteins, it also provides the much-needed sulfur nourishment to the recovering hair follicles. The result is often a remarkable hair regrowth in most balding individuals. It is no secret that Hair-omega is one of the most expensive anti-balding and hair loss formulations in the market. But given that it has recorded some impressive results over a broad range of users from varying ethnic/lifestyle backgrounds, it might be worth the extra dollars. However, you could end up paying such a hefty price for a product that doesn’t work for you. Hair-omega – like most medical conditions recommended for balding individuals – is not tolerated by 100% of the population. Palmetto, for example, one of its ingredients, can cause indigestion if taken on an empty stomach. Hairomega is best reserved for people exhibiting the tell-tale signs premature balding and acute hair loss but who are not allergic or sensitive to palmetto. Although a bit pricey, Hairomega is reasonably effective and is proven to stop and reverse premature to an extent. However, you will want to look for another anti-hair loss pill.